Our good friend Chris excitedly emailed me the other day that his sister was due to have her baby girl very soon and he couldn't wait to be an uncle. So, of course, I asked him what her favorite color is and busted out the needles and the yarn as every baby deserves to have a hand knit hat to keep them warm. I was thrilled to hear back from him today that his sis loved the hat and her little girl was happily wearing it at just three days old! He was even so sweet as to email me a picture of her wearing it. Isn't she darling? Almost makes me want to have another baby. I've got to say, it absolutely warms my heart to see the things I make for little ones being used. It also reminds me that I should send thank you pictures along with the notes for all the folks that made Zig gifts. 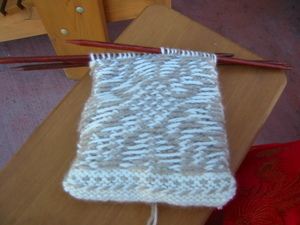 I think that may be what I love the most about knitting - the FOs are like little hugs. A sweet reminder that someone took some time to make you something. 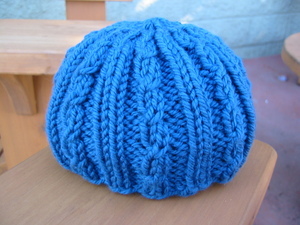 I enjoyed making that little green hat so much that I decided to whip up a second one in blue so I could write up the pattern. I think I shall call it the Teeny Cabled Beanie. Here's a shot of it I took at lunch. Despite being outside, it's not the best representation of the color. Once the hat was bound off I did some frogging on the Fair Isle scarf, I missed the last row of the snowflake pattern on one side of the scarf. So I took the opportunity to weave in the starting ends before continuing on with the scarf. 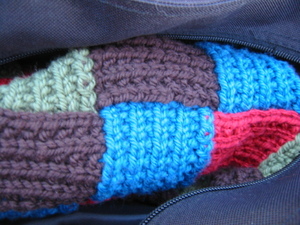 Here's a shot of the inside of the scarf, kind of cool in its own way. Lastly I'll leave you with a sneak peak of a big project I'm finishing up. I've got ends to weave in then it's time for the big photo shoot this weekend. After that the object goes to The Bobbin's Nest Studio and the photos go to the publisher (hopefully to be published online). If not, watch this space as I'll just publish the dang thing myself. Cute cute photos! 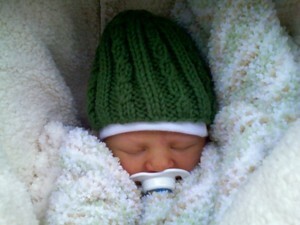 The baby is even cuter than the hat. That hat is adorable! Let us know when you have the pattern available - I'd love to purchase a copy. That little girl looks so warm and snuggly - what a sweet princess. Secret project looks great! This page contains a single entry by published on November 15, 2007 3:36 PM. Fair Isle is Slow! was the previous entry in this blog. I Made Interwebs! is the next entry in this blog.